We no longer ascribe the term ’mermaid’ to those we deem sexually or economically threatening; we do not ubiquitously use the mermaid’s image in political propaganda or feature her within our houses of worship; perhaps most notably, we do not entertain the possibility of the mermaid’s existence. This, author Tara Pedersen argues, makes it difficult for contemporary scholars to consider the mermaid as a figure who wields much social significance. 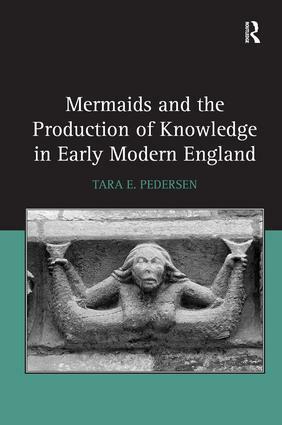 During the early modern period, however, this was not the case, and Pedersen illustrates the complicated category distinctions that the mermaid inhabits and challenges in 16th-and 17th-century England. Addressing epistemological questions about embodiment and perception, this study furthers research about early modern theatrical culture by focusing on under-theorized and seldom acknowledged representations of mermaids in English locations and texts. While individuals in early modern England were under pressure to conform to seemingly monolithic ideals about the natural order, there were also significant challenges to this order. Pedersen uses the figure of the mermaid to rethink some of these challenges, for the mermaid often appears in surprising places; she is situated at the nexus of historically specific debates about gender, sexuality, religion, the marketplace, the new science, and the culture of curiosity and travel. Although these topics of inquiry are not new, Pedersen argues that the mermaid provides a new lens through which to look at these subjects and also helps scholars think about the present moment, methodologies of reading, and many category distinctions that are important to contemporary scholarly debates. Tara E. Pedersen is Assistant Professor of English at the University of Wisconsin-Parkside, USA.